Hi there!!! 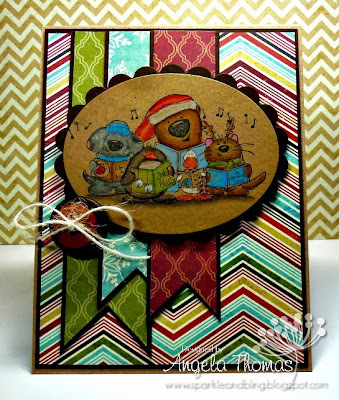 This week at Stamping Bella, we had a fantastic sketch to work with. LOVE IT!!! I'm in love with the fishtail banners on cards and have realized I really should invest in a set of dies for it. LOL. For my card, I have used the Stamping Bella set called "The Choir". Based on the DP I chose for my card (MME Lost and Found Christmas), I decided to stamp the image on Kraft cardstock and then colored it with Prismacolor Pencils and Gamsol. And check, one more Christmas card to add to the pile. Wahoo!!! Next week's challenge is called "Fall-tastic Friday". We want to see fall colors on your card so break out the rusts, orange, browns, greens and have fun with it! !